“Do you know the reason why we call it Laos? Because they all live in huts." We were happy to volunteer at this unknown town Vieng Phouka, but after we met our host Somhuk, it turned out to be a tourist trap. Somhuk is a 50 year old man, he was a farmer before 2006, and after 2006 there was an EU project running in this town. They established an elementary school, health education and tourism industry. Somhuk learned some basic English in short time and became a tour guide. But the project was closed in the second year somehow, all foreigners left and tourists are not coming now to the town. I don’t know where he got the idea of using HelpX for attracting foreign tourists, but anyway, we didn’t regret to be there. 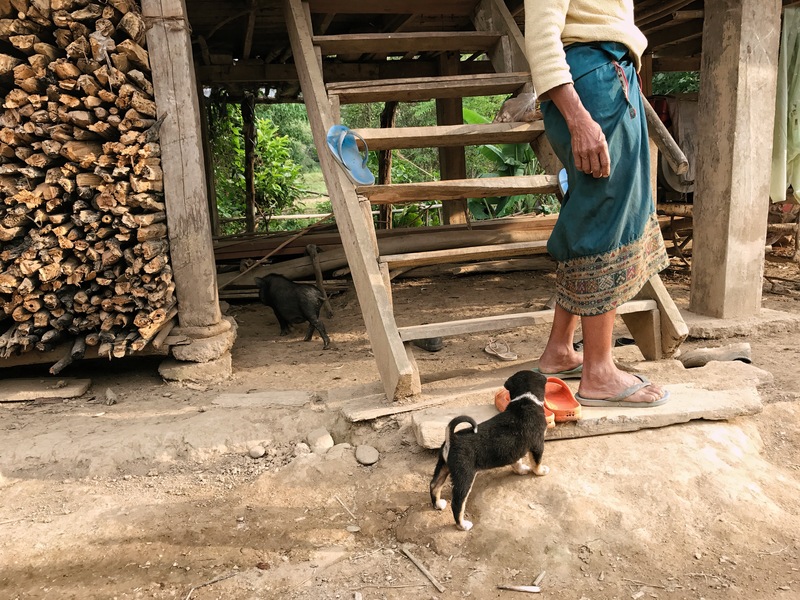 Somhuk took us to the police office for registration, after he brought us to the Khmu village called Ban Nam Mang two kilometers away from Vieng Phouka, where we were supposed to stay. Bumpy loess roads, stilt houses, woman with bag on her forehead was greeting us, it definitely felt like I came to another country. We got off the truck and walked to the community hut, where the village chief was making chicken cage from bamboo. 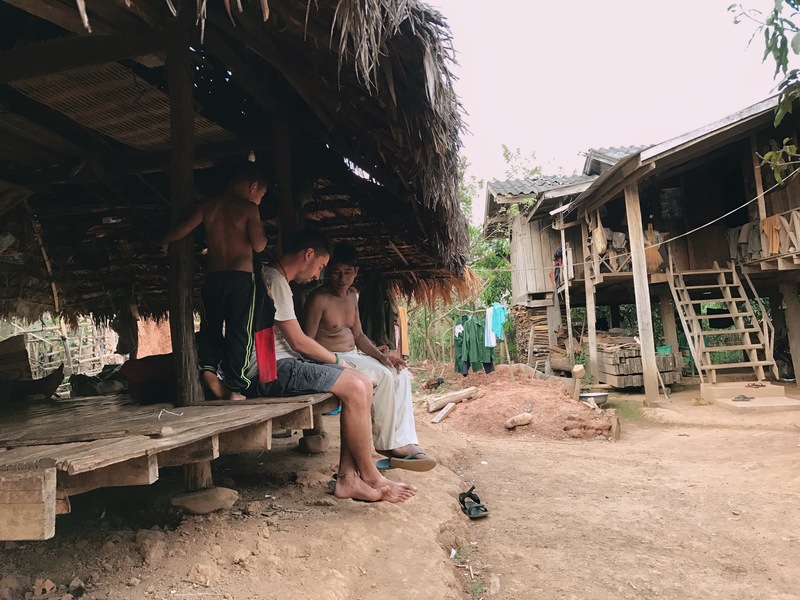 He asked a young man, Tha, to come for us- the only person who could speak English here, very energetic, he couldn’t stop introducing us the local life and environment around. He cooked for us our first meal in the community hut. He used some leaves with special texture to clean the pan, made fire and fried the eggs. “Please enjoy!" Tha always said this to us while we were eating. 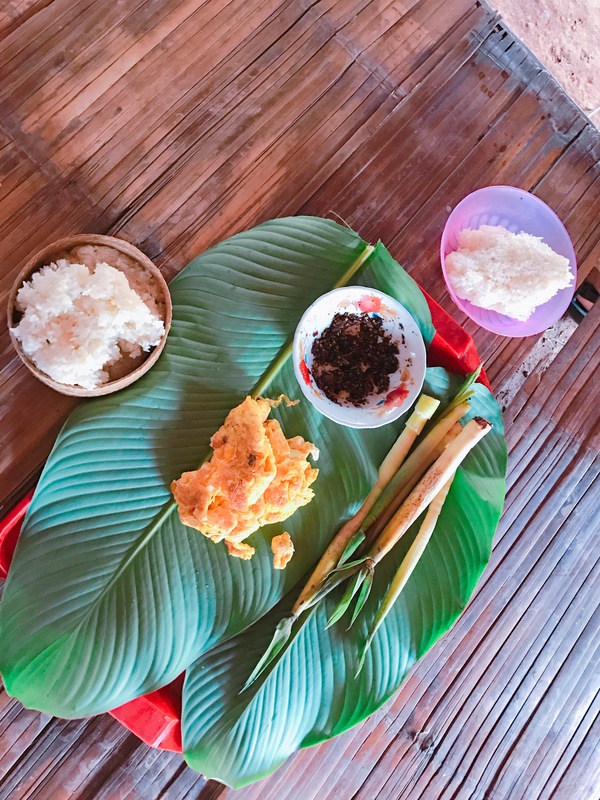 We were sitting on the bamboo mat with banana leaf placemat, sticky rice in handmade rattan baskets and some bamboo shoots and after we finished I realized that I was eating without spoon, folk, or chopsticks just with my fingers. Everything happened so naturally. We had bamboo shoots and sticky rice almost every meal. Every house here has a plate of firewoods and adults and kids know how to make fire for their living, but for modern people we just use fire to barbecue in leisure time. Despite it was Laos new year holiday, roosters still woke people up responsibly at 5 a.m. around that time I was half awake and heard people talking and preparing for work but then I was asleep again. Later I got up at 8 and found all people have left for work to the forest, only old people and babies stayed in the village. It took them about an hour to get to the forest for picking up seasonal food, like mushrooms, tree fungus, spring onion, garlic and baby bamboo shoot. After three o’clock in the afternoon they all returned back to the village, and some of them like Tha’s mom went sometimes to Phouka to sale the vegetables same day she collected them. Relatively speaking, 1000 kips for an egg is a luxury, but for them all the resources they need comes mostly from the forest. 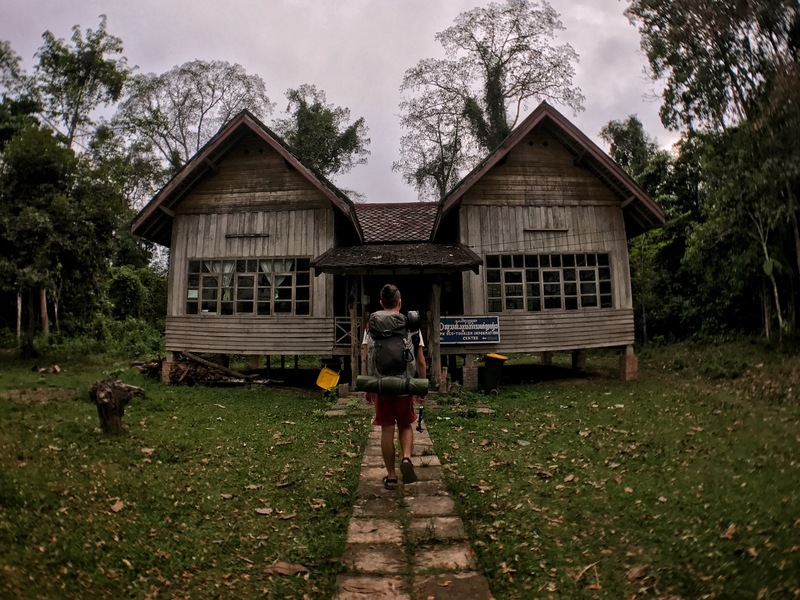 There’s a tiny storage box in the community hut which is used to be a convenient store, it sales usual modern products, like sugar, shampoo, instant noodles and whisky Lao. Sometimes the villagers just come to the hut to chill out, to chat or to take a nap. 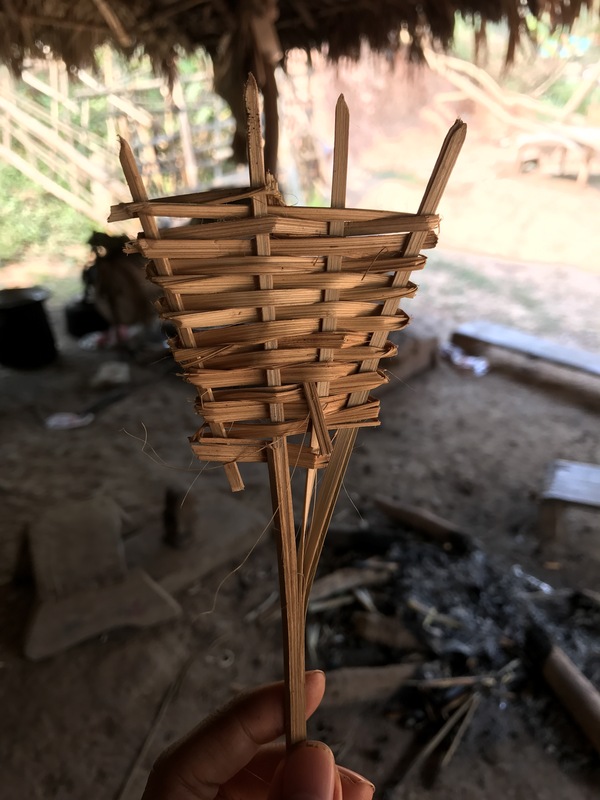 There was a man who could make any stuff easily out of bamboo, he always patiently gesticulated and chatted with us, and actually we were learning English, Mandarin and Khmu language at same time with him. “Wow! Wow! Wow!" we looked like we have never seen the world, we showed our surprise to the things we seen for the first time, and they always laughed at our “wows". 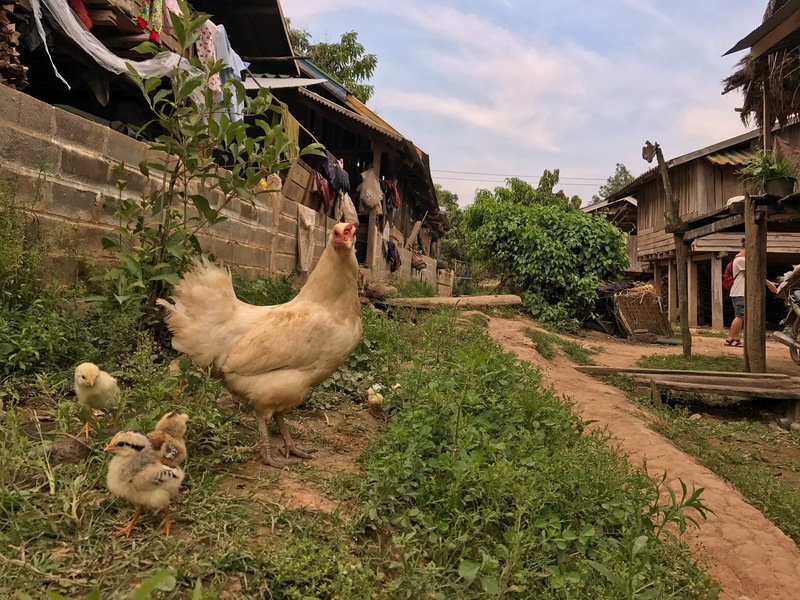 Even if we had a language barrier, we were like the Khmu people and their chickens, ducks, dogs, free to get along in the village together.